You are currently browsing the tag archive for the ‘Pinterest’ tag. 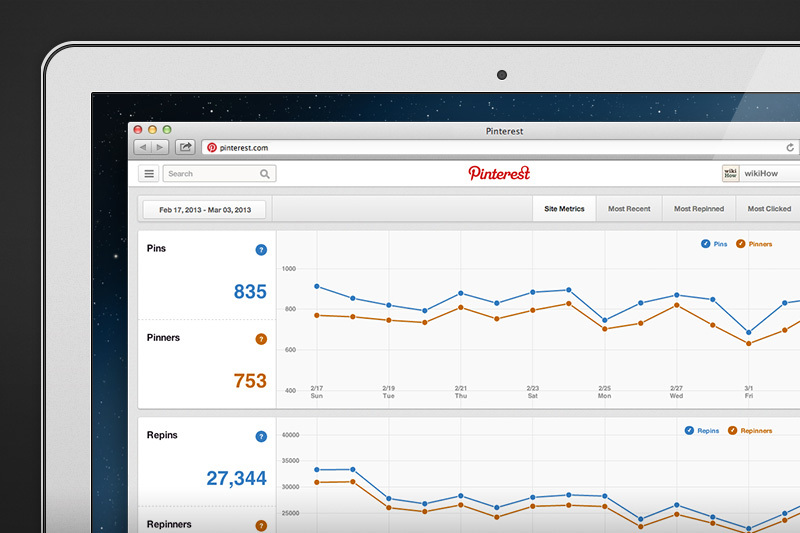 Recently, Pinterest announced its own Web Analytics tool for owners of verified Pinterest pages. Prior to this, Pinterest page owners relied on third-party apps for measurement data. 1. Get early access to Pinterest’s new look. 2. Make sure you have a verified website. If you have a website listed on your profile with a check mark next to it, you’re verified. If not, follow these steps to verify. 3. Once your website is verified, go to the top right menu and click on Analytics. 4. Start exploring! Change your date range to see how things have changed over time or download your analytics to sort through the data on your own time. As a marketer who has been put in charge of several client’s Pinterest accounts I have dove head first into the pinning world. Glamour, recipes, and crafts galore! In fact, I am a more stylish and handy chef than I ever was before the social media site existed. However, not only have I become a craftier individual since endeavoring in the Pinterest world, I have also become a better person. Yes, this social media platform filled with visual stimulation and motivation has empowered me to live a better life. Curious on how my life has changed since I have begun pinning? Continue reading to check out the 4 lessons I have learned from this social media giant. 1. Never underestimate the power of planning ahead. In life, spontaneity can be a good thing. However, there are also times when planning is necessary. For example, a rehearsed speech would have been a great idea when I was the maid of honor in a wedding. Not only could everyone in the room hear me swallow because it was so quiet (my jokes did NOT incite laughter) but my stage fright pit stains showed in every picture taken that night. This same philosophy can be applied to Pinterest. When creating boards, be strategic. Anticipate what type of information your customers would enjoy and think before you pin. I promise that the results of a well thought out board with a solid theme will be more successful than one you just decided on a whim would be a good idea. 2. Always credit your sources. See what I just did there? Give credit, people… nobody likes a thief. 3. Connect with your community. One of the best ways to gain more followers on Pinterest is by connecting with your fellow pinners. Not only will your audience increase but so will your repins. If you ask me, word of mouth marketing is the best approach and will only increase your like-ability. And isn’t this something we would all like in our personal life… to be liked? 4. Quit talking about yourself. We all have that dreaded friend who only talks about themselves. In fact, anytime you see their name on your cell phone caller ID you can’t help but roll your eyes. This involuntary reaction is a result of an annoying predictability that you friend presents. Don’t be THAT friend on Pinterest. Pin others away and I promise people will be engaged. In fact, some of my most interesting friends are those who tell great stories about OTHER people. Have you gained any life lessons through Pinterest or other social media sites? We’d love to hear about them! As soon as Guest Relations Marketing heard of Pinterest, we were hooked. Not only has the majority of our office been Pinning on our personal accounts for months, but we were eager to be an early adopter with one of our clients: Swoozie’s. The vast majority of Pinterest users are women ages 25-54. Swoozie’s target market? The same. Perfect. We signed them up. And while Swoozie’s Pinterest Followers were growing at a strong, steady rate, we knew these numbers could jump significantly. So we came up with a plan. Using the promotion Pin It to Win It, for one day we focused on a single retail item: a pink, plastic tumbler. We Pinned the tumbler along with the message that one lucky Repinner would win it. The Pinning ensued. With each Repin that was made – an entirely new network of Pinners was exposed to the image. By incorporating this promotion in Swoozie’s e-mail, Facebook, and Twitter communications, word spread fast. By the end of the day, not only had the tumbler received 143 Repins, but Swoozie’s had gained more than 100 new Followers and Pinterest was officially Swoozie’s third highest referring website. Considering 6 months ago nobody knew what Pinterest was – these numbers are simply remarkable. Have you joined Pinterest yet? Send me an email and I’ll gladly invite you to your new addiction.